We just returned from Las Vegas. With our entire family. Yes, you heard me correctly. 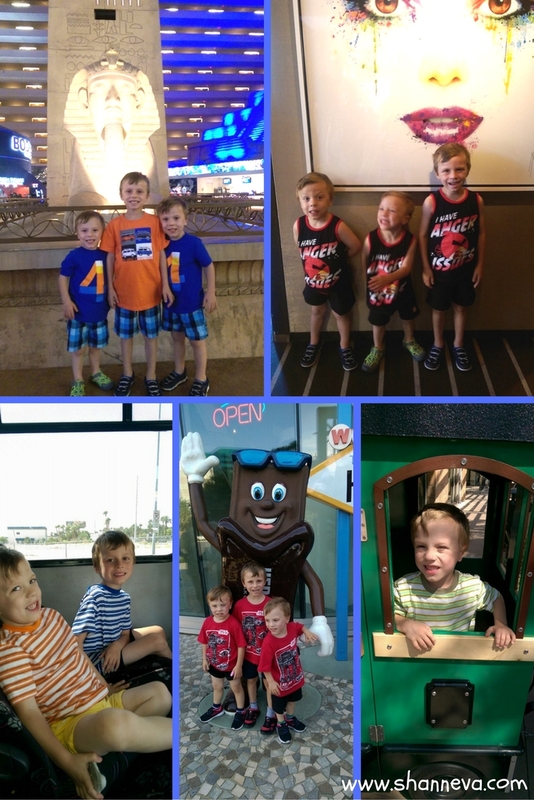 We brought the twins and Mr. B on my birthday trip to Vegas…and we had a great time! When I told people I was headed to Vegas to celebrate my big birthday, I got all the normal responses of excitement. Then, when I told them we were bringing the kids, they looked at me like I was a crazy person. Here’s the thing. Even though they drive me crazy on a daily basis, I love my kids. I didn’t want to leave them behind. Each of us parents has been away from the kids for a couple of nights or so, but never at the same time. I’m sure they’d be fine, but I’m not sure if I would be…yet. 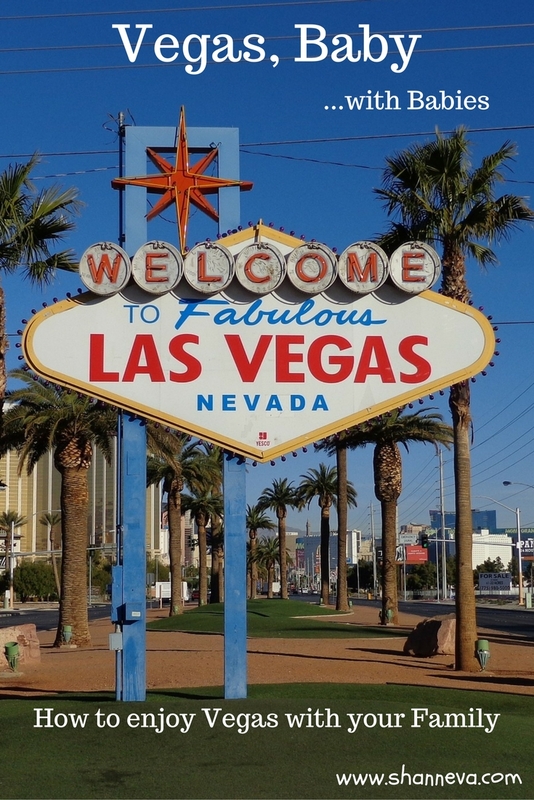 Las Vegas may seem like a strange spot for a family vacation, but we’ve been there enough times to know that it can be a really fun place for everyone. If you’ve never been to Las Vegas, or never considered bringing your family there, I’ve come up with some tips to make it a great trip for everyone. Bring help Grandma and Grandpa came along on the trip with us. It’s just so much easier when the adults outnumber the children. They love Vegas, they love the children, and they love me, so it was an easy choice. If your parents don’t want to come, consider going with another family or even another family member like a cool Aunt or Uncle. Find a Family Friendly Hotel We picked a hotel that was set just a little bit back from the strip. It was not a casino, so there was no smoking. It also had a splash pad/pool for the kids, a full kitchen, and a separate bedroom. This allowed us to put the kids to bed, and still stay up in the living room. Plus, we could store milk (beer) in the fridge, make food in the microwave, and had all the utensils we needed. The price for the rooms was awesome. It was a lot less than most of the casino hotels, and the resort fee (which all hotels have there) was $10 cheaper. Find Family Friendly Activities Of course Vegas is known for its gambling and nightlife, but there is so much more. There are plenty of things to see and do for the entire family. We watched the fountains at the Bellagio, saw the Statue of Liberty and walked the streets of NYC at New York, New York. Then there was the giant Ferris Wheel at the Linq, and a free shuttle to an outdoor mall/play area. We rode the free tram to the Sphinx at the Luxor, Castle at Excalibur, and Aquarium at Mandalay Bay. We also saw the indoor thunderstorm at Planet Hollywood. There’s a giant M&M store, a volcano at The Mirage, the Eiffel Tower Experience, and you can ride a Gondola at the Venetian. There are also shows, like Blue Man Group, that are family friendly. Plan your Budget Some of the activities are free, while others are not. It can get pricey if you want to do a lot of things, so make a budget ahead of time. There are many sites to find discounted tickets. Also, some activities, like the Ferris Wheel, are cheaper during the day. Just make a plan for what you really want to spend money on. Food Eating out for every meal can really get expensive. If you have a fridge in your room, like we did, it’s great to stock up at places like Walgreen’s and CVS, which are right on the strip. Plus, we always had leftovers from the kids, even though all three split a meal. Alternate nights out The great thing about traveling with Grandma and Grandpa is that they volunteered to babysit a couple of nights. 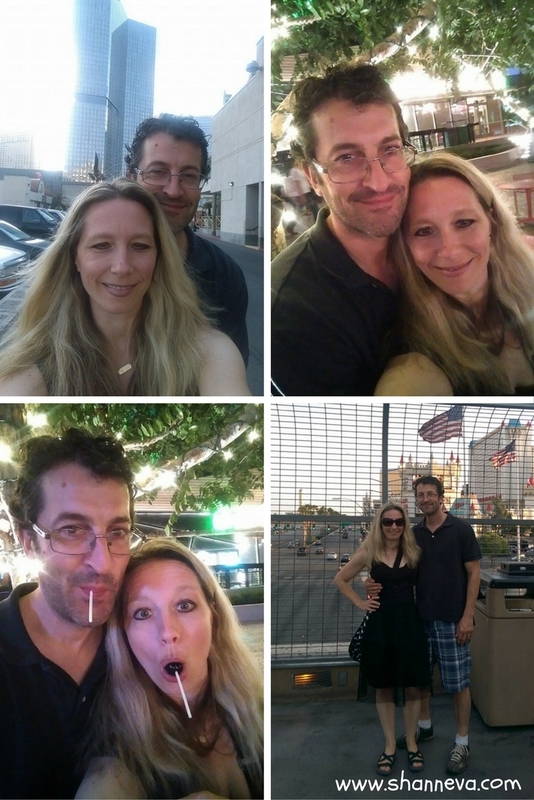 One night, my husband and I met friends out and stayed out late. The next, we just went for dinner, so that my parent’s could then go out and gamble. One night my husband stayed in with the boys, while I went out gambling with my parents. The next, he took Mr. B out to see all the sights at night. The last night, me and my husband had a really nice date night, after everyone having a nice lunch together. It was really a great mix of family time and alone time. We spent most days all together, but I got to shop with my mom a few times, and my parents also got some alone time during the day. Stranger Danger Like any big city, there are TONS of people. No matter where you go, there are probably going to be crowds. Just make a plan to stick together. If you get separated, make a place to meet. There are usually security guards around the Casinos, so point those people out to your kids, in case they get lost. You don’t want them just asking a random person for help or going with someone they don’t know. There are now a lot of costumed characters on the Strip, which could be very tempting for little ones. Make sure you emphasize not to go with any of them. Stroller Even though our kids are 4 and 6, there is a LOT of walking in Las Vegas. We brought two really cheap umbrella strollers with us, and they sure came in handy. I think Mr. B was probably in the stroller most of all. The airlines let you bring them for free. You just can check them right at the gate, and they bring them to you when you land. Sure, Las Vegas can be a crazy place. What happens in Vegas stays in Vegas, right? Well, it doesn’t have too. At least not all of it. I had a really great time shopping, gambling, dining at restaurants, and even going out with friends, while still being able to spend time with my entire family. The boys got to see a ton of new sites, experience their first airplane ride (which they LOVED!!!) swim, and play. Things that we, as adults, take for granted are so much fun for kids. The limo ride to the airport was amazing for them. Eating at restaurants, staying up late, and not taking naps probably made the whole trip worth it to them. Everything seems exciting when you look at it through your kids’ eyes. So, what do you think? Would you take a family trip to Vegas? Have you been on a family trip somewhere else that people thought was a little strange? Great tips!! I love Vegas and am pregnant with my first, so it’s great to know it’s totally doable with kids! Seems like a fun family trip! Bringing the grandparents is a must in my opinion, that way everyone gets some adult time! Gosh, it looks like you guys had a wonderful trip! Glad you had a wonderful Birthday with your family! I have been to Vegas more times than I can count… and not once as an adult! haha. I’ve only ever experienced it as a child, when my mom would bring me to visit a friend that lived there. Also…wait for it…my parents were married in Vegas. hahaha. I can personally vouch for the fact that Vegas is indeed magical for a child as well, I always loved it. I went to Vegas with my family when I was in high school. It was a lot of fun even though I was not old enough to gamble. There are so many family friendly things to do there. I am so glad you enjoyed your trip with your family!!! Thank you very much for sharing this. I haven’t had the chance to go yet with my kids. But it sounds like I should think about it as their next trim. Such a great trip. Ive never been to Vegas but its on mil its of place to visit. I never knew there were so many great place for family. 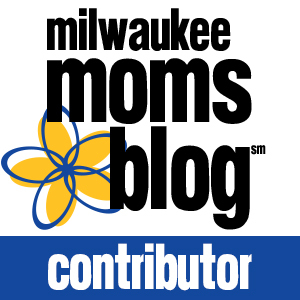 I love traveling with my kiddos, so I am so thankful for this post! Thanks for the great info and encouragement that you CAN travel to Vegas with the kids! So glad you had a great trip! It sounds like you had an awesome time with the perfect mix of family and adult alone time! I love that your parents went with you.. we travel with my husbands parents all the time, it makes it so much more fin I think! How fun – looks like you had such a great trip! Love all the pics and all the happy faces in them! Looks like you had so much fun! I’ve never been before but this totally makes me want to go! Yes! Let’s meet for a blogger/girl’s trip! I was shocked at how many families were in Vegas on our first trip but you are so right that there are many things for a family to do. Vegas is truly becoming much more than gambling. I absolutely love heading to Vegas for a quick getaway. I love that you and your family were able to take advantage of all the fun, free and age appropriate things there are to do there. Good call with the stroller…I could use one of those for me sometimes when in Vegas. You do far more walking than you realize. Ha! I know! I wish I could have fit in one. i wouldn’t have thought to bring my kids to Vegas, but it makes SO much sense. i totally want to take them there now! I have no desire to go to Vegas, but I think it’s great that you were able to include your kids in the trip! Family vacations are so much fun no matter where you go. Looks like you guys had fun! I’ve always wanted to go, but never considered bringing my boys. Great tips! AW!!!! Looks like you all had an absolute BLAST!!!!! We loved Vegas 🙂 I thought it was going to be scummy and it was better than I expected! I actually liked it more than New Orleans…I kept comparing the two in my head. I love Vegas! I haven’t brought the girls there yet but I never thought to bring kids until seeing my gf always stop their on her way to UT or AZ (we live in CA) and they’re always doing fun stuff! I would never have thought to bring kids to Vegas. It looks like you guys had a wonderful time! I’ve always wanted to visit Vegas, but I never got a chance before married life/children. I’m happy to see you were able to enjoy your stay! I remember going to Vegas when I was 6 years old. Bet my mom and dad could’ve used these tips back then lol! I actually went when I was a kid too. I remember Circus Circus! You’re a brave mama! I am too much of a worrier to bring my kiddos to Vegas, haha. I never would have thought of bringing kids to Vegas so it’s awesome to see what you can really do with them in tow! Great info here because my husband and I were thinking of bringing the boys with us to Vegas when we go next January – and bringing the grandparents along as well! You are a trooper!! I havent’t braved a big vacation with my boys, yet. We plan to in the next couple of years. It does look like you had a great time, though!! That is sooo awesome-and truly looks like it was a blast!! 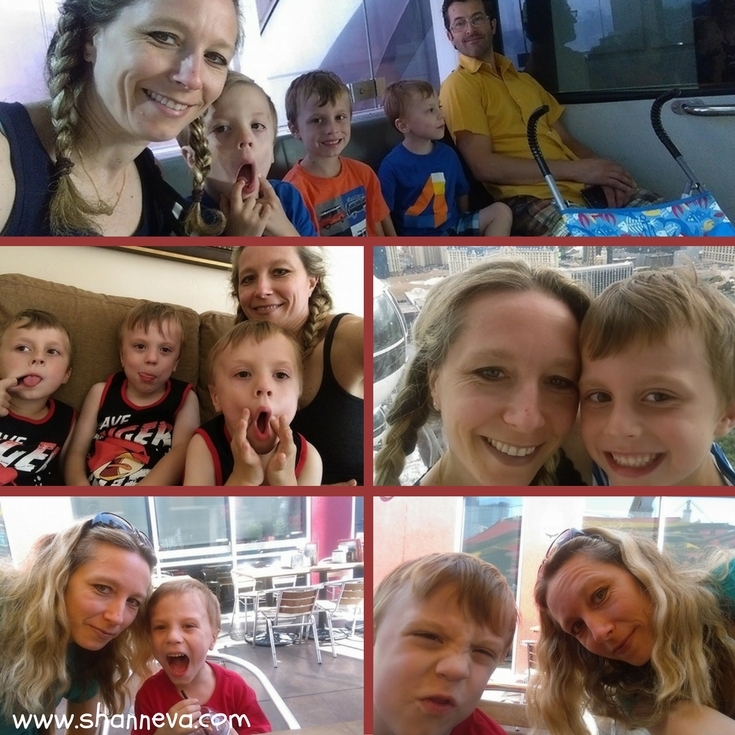 Definitely a brave mama bringing the kids on vacation…to Vegas of all places, but how fun! I had no idea Vegas could be geared toward families if you looked in the right places. Thanks so much for sharing!